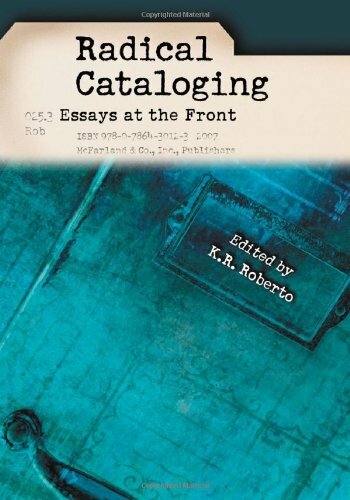 Amazon.com description: Product Description: This collection of critical and scholarly essays addresses the state of cataloging in the world of librarianship. The contributors, including Sanford Berman, Thomas Mann, and numerous front-line library workers, address topics ranging from criticisms of the state of the profession and traditional Library of Congress cataloging to methods of making cataloging more inclusive and helpful to library users. Other essay topics include historical overviews of cataloging practices and the literature they generate, first-person discussions of library workers' experiences with cataloging or metadata work, and the implications behind what materials get cataloged, who catalogs them, and how. Several essays provide a critical overview of innovative cataloging practices and the ways that such practices have been successfully integrated in many of the nation's leading libraries. About: This collection of critical and scholarly essays addresses the state of cataloging in the world of librarianship.